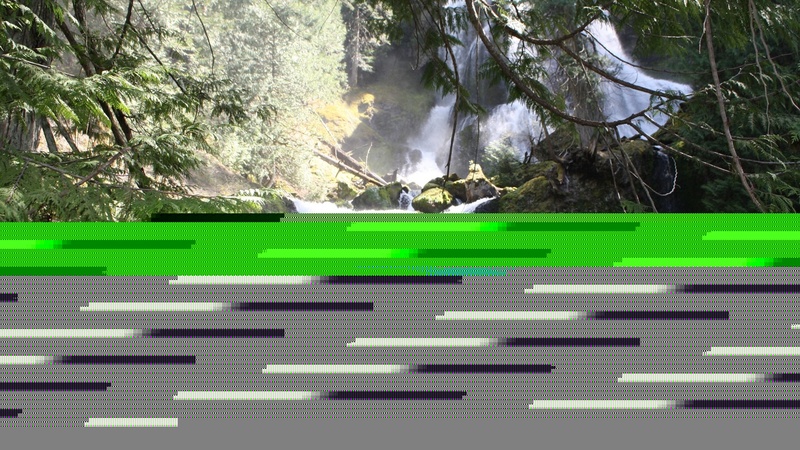 Wales is a beautiful country with a whole host of attractions. To help you decide where to visit, here’s our top must-see attractions. From vast expanses of golden sand for family fun, to rocky foreboding cliffs perfect for the intrepid explorer, Wales’ beaches have something for everyone. Two top beaches are Barmouth in West Wales and Southerndown in South Wales. Barmouth lies between a mountain range and the sea on the mouth of the river Mawddach. The old town has steep steps and slate-roofed cottages on the side of a mountain and from the quaint harbour you can walk across Barmouth Bridge which spans the river. The beach itself is large and sandy, perfect for children, and has a range of shops and pubs, with a funfair and amusements in peak season. The beaches near Southerndown are wonderfully dramatic. Take the Beach Road (off the main B4524 in Southerndown village), and you’ll find several car parks with the main one having a refreshment and toilet building too. If you carry on walking past this car park, towards the trees in the distance, the main path leads to a gate through the trees which opens out onto the cliffside. The view is stunning, with the combination of rock and sand forming huge patterns on the beach. You can tackle the path down to the beach but tentative steps are needed. 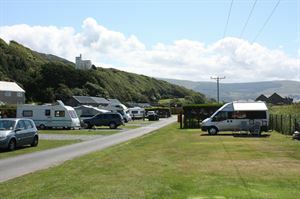 Great site for families just 100 metres from Barmouth Beach. Great for dog owners as Barmouth town is dog-friendly. Campsite with two areas – one for families and one for couples. Near Cardiff, three miles from the coast, six miles from Southerndown. 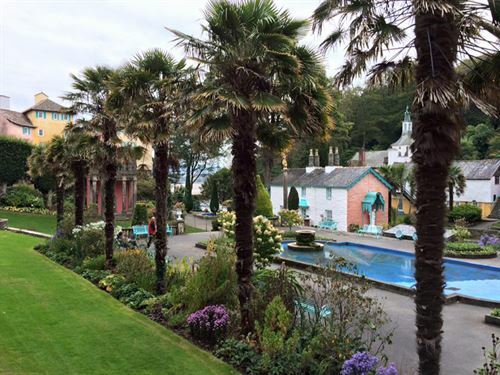 Set on its own private peninsula on the southern shores of Snowdonia, Portmeirion is north Wales’ premier visitor attraction. Used as the set for cult sixties TV series The Prisoner, it was designed by Welsh architect Sir Clough Williams-Ellis in the 1920s, and it represents his fantasy of a classical Italianate village in the Mediterranean, transplanted to a romantic clifftop location. You pay an entry fee and then step into another world. Feast your eyes on around 50 buildings, pastel-painted, with shuttered windows, a grand piazza, and 70 acres of surrounding woodland and sub-tropical gardens filled with exotic plants. There are woodland paths to explore, and when the tide is low you can walk along the sands. The village has several cafés and restaurants too and is open every day of the year. Nestled at the foot of Moel-y-Gest mountain, surrounded by wooded countryside. Just three and a half miles from Portmeirion. Electric pitches with all-weather surface. Stunning views. The Pembrokeshire Coast National Park is wild and gorgeous. For family activity holidays it’s the perfect location, with wildlife watching, watersports and plenty of walking. The National Park was established in 1952 and is the only one in the United Kingdom to have been designated primarily because of its spectacular coastline. The park has a varied landscape of rugged cliffs, sandy beaches, wooded estuaries and inland hills. For walkers there is the Pembrokeshire Coast Path – a total of 186 miles long, mostly at cliff-top level with outstanding views. Located in the heart of the Pembrokeshire Coast National Park this site offers some of the most dramatic coastal views. Walkers and nature lovers can explore the many paths and trails accessible directly from the park whilst those just wishing to relax can sit back and enjoy the spectacular views. Wales is home to over 600 castles, four of which have been designated UNESCO World Heritage Sites – Beaumaris Castle, Anglesey, Caernarfon Castle, Gwynedd, Conwy Castle, and Harlech Castle, Gwynedd. Harlech Castle, Gwynedd, combines medieval architecture with a breath-taking hilltop location. It is perched on rock looking out to Snowdonia and the panoramic view from its lofty battlements is a must-see. Carreg Cennen Castle, Carmarthenshire, sits on a limestone cragg with a view 300ft above the river. With stunning views and a secret underground cave, this is a great castle to explore. Set in Snowdonia National Park and close to the sea. Fully serviced pitches. Toilets, showers, laundry and shop. Surrounded by countryside with great walking routes. 15 minutes from Harlech. Near the pretty town of Llandovery and handy for the Brecon Beacons. Tranquil and neatly maintained, the site has an outdoor play area for children and also offers bike hire. Carreg Cenne is half an hour away. On the western tip of the Pembrokeshire peninsula lies the smallest city in the UK – St Davids. It is a pretty place, famed mostly for the small, yet perfect, cathedral named after the country’s patron saint. The city is also surrounded by some of the finest coastline in Wales and situated in the Pembrokeshire National Park. St Davids is a good place to enjoy some fine dining. The Refectory located alongside the cathedral serves tasty rustic lunches such as cottage pie with Welsh ale. For dinner, the Michelin-starred Cwtch offers excellent local seafood, Welsh Black beef and Pembrokeshire cheeses in a relaxed, homely environment. Featuring an incredible cliff-top view, Caerfai Bay offers over 100 touring pitches, with a small sandy beach accessed via a path down the cliffs. St David’s is a 10-minute walk away. Exploring Wales’ rich and vibrant history makes for a great day out. And even better – the museums are all free to enter. Big Pit, Torfaen, is the National Coal Museum where you can go 300 feet underground in the pit cage to discover what life was like for miners and walk through the underground roadways. Above ground explore the colliery buildings, blacksmith’s workshop and learn about coal’s extraction from below ground. St Fagans: National History Museum, Cardiff, is on the outskirts of the city and is an open-air museum exploring Welsh lifestyles and traditions. Visitors can discover original buildings from different historical periods and see how people lived in times gone by. It also features recreated workshops where craftsman demonstrate their traditional skills. Other museums include: The National Museum Cardiff, The National Waterfront Museum, Swansea, and The National Wool Museum, Carmarthenshire. Next to country park with orangery, garden and woodland, plus adventure playground. Ornamental lake on site. Seventeenth century Tredegar House open to public. Usual CC facilities available.